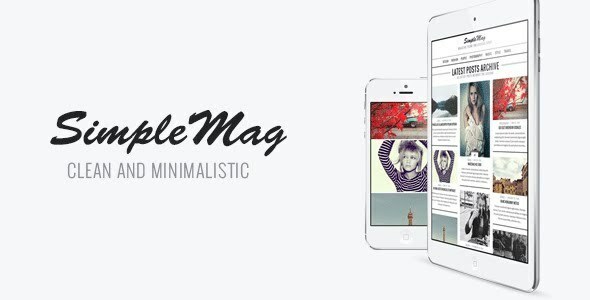 Responsive SimpleMag looks good on any device, from big desktop monitors to small smartphone screens. OFF-Canvas navigation & sidebar for mobile devices Great feature for browsing the site in mobile devices. No hidden content or sidebars even on the smallets smartphone screens. Google Fonts SimpleMag comes with 500+ fonts from Google font library with preview, for both titles and text. Touch Friendly All sliders are supported for mobile devices. Page Composer Very easy to use and intuitive page composer. Add, rearrange the order, change the settings of the sections. Mega Menu Each category in the main menu can have a mega menu dropdown with sub categories and latest posts. Different Categories Layouts Each category can be configured differently. With or without the Slider, with or without the Sidebar, two or three posts columns. Static Pages Any static page can be full width or have a sidebar. The option is available on page edit screen. No special templates needed. Post Options Any post can be added to Homepage slider, Category Slider or marked as Featured. Post Single Page Social share links, author box, related posts, slide dock with random post. Everything can be turned on/off. Built in Review System You can add the breakdown score of the post content. Score box have a unique and stylish design. WP Gallery Unique layout for native WordPress Gallery with Swipebox support. Self Configurable Footer Footer is devided into three widget areas, but you don’t have to use all three to make the footer look good. Use only the first, the first and the second or all three. It will look great either way. Color Settings Change the default yellow color to any color you like with Theme Options color palette. Demo Content – Does not include all posts and images from the theme preview. SimpleMag comes with a child theme support. Upload the child theme and customize your site without changing the parent theme core files. About the site – Add info about your site, add a small logo (Upload the image in Media section of the admin, copy the URL of the image and paste it in the Logo field in the widget), enter your social profiles links. Authors – Show a list of authors with in a nice little slider. Featured Posts – Featured posts with a slider. Latest Posts – Show the most latest post. Available options: slider or list. Top Rated – Show the top rated posts with a score. Video – Add video page URL from any video site. Vimeo, YouTube, etc. We have created a very nice and lightweight shortcode generator plugin with very understandable and intuitive interface. Contact Form 7 – create unlimited, flexible contact forms. We used this plugin in Live Preview in Contact page. Force Regenerate Thumbnails – Usefull if your site already have a lot of content and images. Allows you to delete all old images size and regenerate the thumbnails for your image attachments.